Based on reviews from 32 experts and 7,486 users. Learn how our rankings work or see our guide to Merrell trail running shoes. Updated Apr 2019. Based on more than 100, 000 shoe reviews, casual and professional runners trust Merrell shoes for their fitness activities and competitive events. The well-known Merrell trail running shoes are packed with brand-exclusive and trusted shoe innovations. Purchase a pair of Merrell trail shoes or read more to get convinced. The bipedal nature of the human foot has proved one thing consistently: we are able to tackle distances and different types of terrain with ease and finesse. The act of running didn’t start out as a sophisticated form of biomechanical training; it was innate in our ancestors. They used their feet and legs to chase and flee and to assert their dominance over the various aspects of nature. And of course, they have passed on their capacities to us, their descendants and future improvers of their initial craft. Everyone was running on the trails. Paved roads weren’t very popular ‘til the tail-end of the 18th century, so most people were stepping on uneven terrains since time immemorial. And actual competitions for trail running were really only given any formal and recorded attention at that same time. Shoes of that time were also just progenitors made of animal skin, thin canvas and extremely thin soles. None of the options given to the people of that ere were close to being agreeable for unpredictable and uneven ground. The 20th century was a time of great innovation in the world of running shoes. Even trail running shoes were given a chance to rise as more and more people are drawn to off-road adventures. Innovators have since devised new methods of protecting the foot from the potentially harmful elements of the great outdoors. The soles of shoes have taken a much-needed evolution, moving from thin canvas and gum-based flat platforms to foams and protective outsole layers. The time of the trail runner has come full-circle. Merrell was born from the desire of Clark Matis and Charles Schweizer to create a company that would launch new boots for hiking. 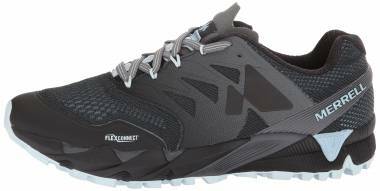 They collaborated with famous boot-maker Randal Ivan Merrell to strengthen their design philosophy and to acquire one of the foremost minds in the business of hiking shoes. 1981 was the year of Merrell, a name fitting of the high-quality standards set by R.I. Merrell and his $500-per-pair custom creations. The 1980s were busy years for the fledgling company. The first prototypes of boots that were high in quality yet affordable in price were put into the drawing board by Matis, eventually coming out of manufacturing. Hiking boots were the specialty of the people at Merrell, so they went on to provide pairs for people within their market. A whirlwind of events gained traction as R.I. Merrell returned to independent production in ’86 and as the company was sold to Karhu in ’87. But the Merrell brand grew under the Karhu banner, seeing its financial status improve as the years go by. Another transition happened; Merrell was sold to Wolverine World Wide, one of the most prominent entities in the world of footwear production and marketing. The minds at Wolverine sought the evolution of Merrell, desiring to expand its reach to include other activities like trail running. Such a plan resulted in the “Jungle Runner,” a lightweight model that was commercially available. It wasn’t a successful model, so Matis and a team of innovators went on to create a highly trail-ready product that utilized a lug-laden outsole and a trendy pig-suede upper. The shoe that Matis et al. designed was considerably well-received by consumers. They felt that it was the one that put Merrell trail running shoes for women and men on the map. It was named “Jungle Moc,” and it’s still used as the foundation on which the current Merrell trail runners are made. Tens of millions of Jungle Moc sales followed, and Merrell turned into one of the most recognized brands for off-road (and eventually on-road) products. Some of the best Merrell running shoes are still available, hardly exiting the market due to steady demand and praise. The designs of the Merrell trail running options aren’t very aggressive or bulky. In fact, some people may even mistake them as optimized for road running or casual use as they’re colorful and sleek-looking. But a lot of technologies work together in Merrell’s line to make them as responsive and as sturdy as possible. Vibram® outsole – Many companies utilize the Vibram® outsole compound as it is one of the most reliable layers of protection against wear-and-tear. High-quality rubber is the source of this technology, and it’s meant to last long, resisting the abrasive nature of the outdoor topography. Tough terrains are the specialty of Vibram® though it can also handle the slick ground. Many trail runners abide by this external layer, respecting its steadying and shielding nature. A majority of Merrell shoes feature this accouterment, especially the ones that are meant for running. M Select™ GRIP – M Select™ is a line of technologies that are custom-selected by Merrell to grace its running shoes. The GRIP specializes in tear-resistant performance on all types of terrain. It also features well-spaced gripping lugs to provide traction and self-cleaning capacities, mainly since the trails are most likely filled with mud or outsole-hugging stones. There are pillars of stability (still gripping lugs) on the perimeter, helping the runner when it comes to stabilizing the self on the irregular paths. M Select™ FRESH – An antimicrobial treatment process is applied to some of Merrell’s trail shoes. This protective sheen is tasked with breaking down microbes, eliminating the potential for odor. It also has moisture-wicking capabilities that prevent sweat from being absorbed into the fabrics and inner padding. Breathability isn’t impeded by this technology as it is thin and has an incognito structure. TrailProtect™ Pad - A thin yet durable layer is placed in the midsole, right between the midsole and outsole. The purpose of this seemingly inconsequential add-on is to strengthen the structural integrity of the underfoot platform. Moreover, it has the goal of protecting the foot from sharp objects on the trails. The All Out Crush Light is one of Merrell’s most well-received running shoes. It utilizes some of the brand’s most popular technologies like the GRIP and the TrailProtect™ Pad. It’s a straightforward trail companion, doling out performance that’s precise and safe. The façade is made of mesh and printed overlays that are stitch-reinforced. People noted that its build follows its name as it has a lightweight configuration that’s great for extended use. The Tough Mudder events are some of the most exuberant activities for obstacle course racing enthusiasts and pure mud runners. Merrell created a version of their All Out Crush that has the Tough Mudder distinction on it, which means that it has been optimized for the event (or similar activities). The M Select™ GRIP on the outsole has been configured to have wider spaces for the natural sloughing off of mud. An open construction is applied to the façade, with porous mesh draining water quickly whenever the shoe is immersed. People were highly appreciative of the Merrell Trail Glove 4. They welcomed its highly adaptable design, stating that it worked well as a partner for short runs and extended adventures off the road. The façade was also praised as it fits them like a glove, understanding the brand’s naming conventions for this product. The glove-like fit also meant that this shoe was highly flexible and lightweight. Even trail runners who didn’t want a bulky product were happy with the minimalist structure of the Trail Glove 4. How do I clean my Merrell trail running shoes? If your trail shoes are used infrequently or if you’re not using them for aggressive trail adventures, then you should only wipe off the dirt using a cloth or a mild-bristled brush. Once the dust has been removed, you should store them in a place that’s not stuffy or bereft of air. Proper storage can also affect the longevity and cleanliness of your shoes. But if you’re an enthusiast of rugged off-road running, then you should remember to clean off any stuck mud, stones or trail debris using a wet cloth and a mild soap solution. Warm water works best to preserve the structural integrity of the shoes’ silhouettes. Drying off the shoe would mean opening the shoe through the removal of the laces and the insole. Direct sunlight is never good for shoes, so air exposure is the best way to dry them off after a wash.
What do I do if a Merrell trail shoe that I like isn’t available in half-sizes? If you like a shoe, but that shoe doesn’t fit you well, then the next logical choice would be to get the next half or full size that precedes or succeeds it. Being able to wear the shoe and be comfortably snug inside of it is one of the paramount aspects of the purchasing decision. If a half-size option is available, you might want to try that first as it only opens up the in-shoe experience mildly. Now, if the half-size version is still tight, then opt for the next size above your original choice; that may open up the in-shoe fit. And if the half-size version is loose, size down from your first selection.